goat is part of the Basic English 850. 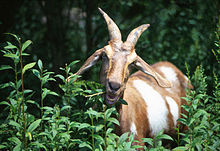 A goat is a mammal with horns, part of the sheep family. The goat used to graze in the field. This page was last edited on 14 April 2018, at 09:03.